The Gingerbread Village by Epicure is back at Melbourne Town Hall this year for little ones to visit until Christmas Eve. 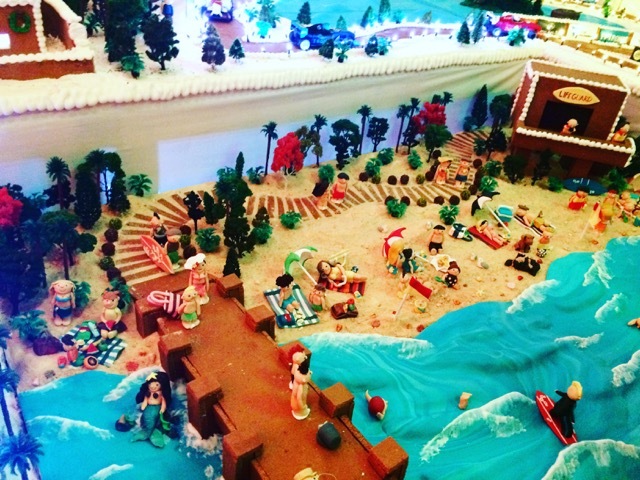 Epicure’s award-winning Executive Pastry Chef Deniz Karaca and his talented team have spent months bringing his Gingerbread Village vision to life. The village comprises of 500 kilograms of gingerbread, 360 kilograms of royal icing, 150 kilograms of marzipan and around 800 miniature Christmas trees for the festive backdrop. New additions to this year's village are the F1 Grand Prix and what appears to be St Kilda Beach with boats, mermaids and all! Our favourite parts of the village this year was the moving carrousel, the beach and the Zoo with those cute little penguins! Little Miss didn't want to leave without her own gingerbread on the way out of course! The Gingerbread Village by Epicure is now open till Saturday 24th of December at Melbourne Town Hall. Open times between the 1st to the 10th of December are 10am to 6pm and 10 am to 8:30 pm from the 11th of December till the 24th of December. This is a FREE event however entry is by nominal gold coin donation where all proceeds go to the Make-A-Wish Australia foundation. For more info, go to their website or their Facebook page.